Sudharshana Narasimha Maha yagam started on 23.04.2010 with special pujas in Yadagirigutta., this yagam will be continued till next 6 days and completed on coming fullmoon day with Purnahuthi. 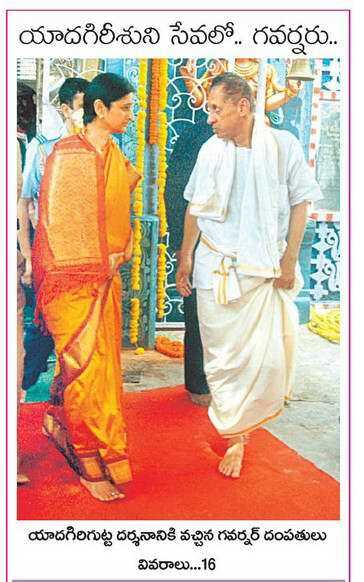 State Governor Mr. E S L Narasimhan visited Yadagirigutta Sri Laxmi Narasimha Swamy Temple along with his family members yesterday 08.04.2010. temple authorities and priests welcome them as per the temple traditions with sannayi (sehnayi) & manthrocharana. from Guest House to the Main temple they welcomed them on Red carpet on Uphill. due to the current situation of the state conditions, Police arranged strict security through out the Yadagirigutta town and also on uphill. Governor almost did around one hour special puja in the main temple, along with the priests he also read the slokas and mantras during the puja and he feel very satisfy and happy and told to the temple authorities that he will come again. Nalgonda District Collector Rizvi, Superintendent Police Rajesh Kumar visited to Yadagirigutta temple while they are on the duty for the Governors visit. Temples priests given special aashirvachana to them. Loksatta Party Leader Jayaprakash Narayana (JP) visited Yadagirigutta temple along with his family members yesterday (08032010). 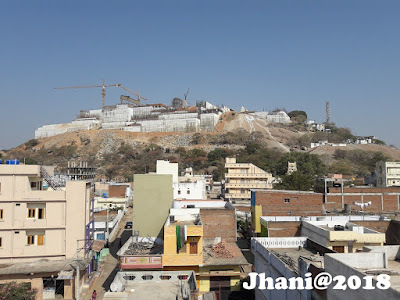 he told to the media that since this temple is very near to the State capital should be developed more and facilities to be increased for the devotees. During the Yadagirigutta Temple visit, Governor E S L Narasimhan spoke with Press and express his .opinions. In view of Chattisgarh Naxal issue he told any issues can be sortout with peachfull talks only. when reporters asked about the Telangana he completed talks with "No Comment".